Photo sharing is definitely interesting and fun but what if you want to add some exciting twist to it? Perhaps, you could just tease your friends by sharing them some photos that could only last for a few seconds. That will definitely make your photo sharing experience more exciting. If you don’t have any single clue as to how to share those kinds of photos, then you better try this free photo sharing app for Android called Blink Me. Blink Me is a free photo sharing app for Android tablets and smartphones. However, it’s not like your usual photo sharing app. When using this app, you can share photos that will only last for a few seconds.. sort of like SnapChat. So it’s like the photo will self-destruct in just a blink of an eye and after that, the photo will permanently disappear and it won’t leave any trace or whatsoever. 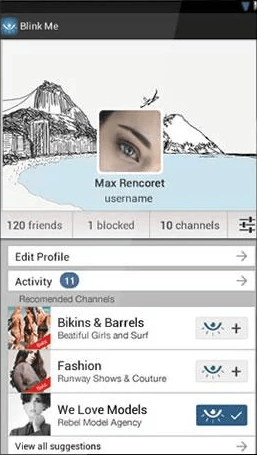 To use this app, the first thing that you need to do is to create a new user account. After that, you will be taken to the app’s main page and you can just follow the on-screen guide. When sharing a photo, you can opt to directly take a picture using your phone’s camera or you can simply share the ones that you already have on your photo gallery. What’s even more interesting is that you can edit and enhance your photos by adding some cool filters, backgrounds and fonts. You can also specify your photo’s self-destruct time. 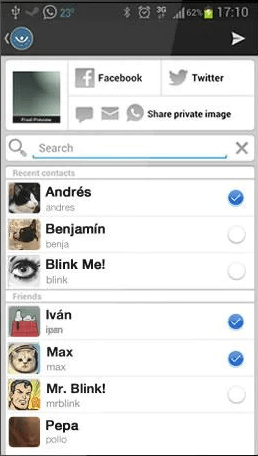 Once you’re done, you can share your photo to your Blink Me contacts. You can also share them to your other friends via e-mail, SNS, SMS, Bluetooth, Facebook and Twitter. Blink Me is basically an app that you can use to send some self-destructing photos. It’s just that this app is a bit different from those other self-destructing photo apps because it’s social. With this app, you can have your own profile. You can also find your friends using their Facebook account and contact number. If they’re not on Blink Me, you can invite them up via SMS or e-mail. Aside from this, you can also follow a lot of interesting channels. So every time that certain channel shares a photo, that photo will be automatically sent to your inbox. What’s also great about this app is that it features an attractive and user-friendly UI. Its user interface looks very neat and well-designed plus its features are very stable. You can also check your inbox for any new updates especially from your friends and contacts. So it’s like when you open the photo that was shared to you, you can only view it for a few seconds. After that, the photo will permanently disappear from your inbox plus it won’t leave any trace which makes it difficult to track. The interesting part about sending self-destructing photos is that you can just tease your friends in a way that they could only catch a glimpse of your photos. There’s an element of intrigued and curiosity for every photo that you share and compared to the traditional way of sharing photos, it is definitely way more exciting and fun. As for Blink Me, it definitely does what it is intended to do and to make it even more interesting, it will even let you edit and enhance your photos right before you send them to your contacts. You can add a lot of cool effects plus you can also add some creative captions and photo backgrounds. That’s not all. This app will also give you the opportunity to set the time or duration before your photo will self-destruct. The self-destruct time can be as short as a blink or it could also last for three to five seconds. Apparently, this time duration is already enough for your contact to view the photo that you’ve sent. While I do not really have any serious issues with this app, I just think that it would be nice if it has an option wherein you can explore for more interesting content. This way, you can discover a lot of interesting people who also wish to share their own self-destructing photos. It would also be great if this app could allow you to post your photos to your own profile. I find this app to be very interesting. I’ve already stumbled upon a couple of self-destructing photo apps but so far this app has managed to catch my attention. I like the fact that it features a social aspect to its functionality plus the images that you share won’t last for too long and once they’re gone, they’re gone forever. So if you’re in the mood for this type of photo sharing activity, better try Blink Me. The only problem? Getting your friends and family to use it. Indeed, my guess is most people who want to use an app of this type are already using SnapChat .